H&H Mobil has a team of expert auto repair professionals that specialize in muffler repair and replacement. Located conveniently in East Lansing at the Corner of Haslett Rd and Hagadorn, our team understands that muffler replacement and repair is a necessary part of a fully functioning car. That’s why our team works quickly to assess your muffler, make a recommendation and repair or replace your muffler to get you back on the road as soon as possible! 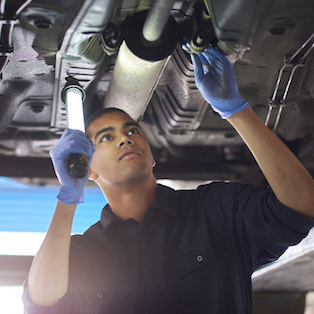 At H&H Mobil, our auto repair team will give you expert recommendations about muffler repair for your vehicle. Our muffler evaluation and repair process is very straight-forward. First, we’ll have you come in for an muffler evaluation with our expert East Lansing muffler repair team. Then we’ll assess the issues you’ve been experiencing with your muffler, whether that be a loud noise or strange odor. Some mufflers will need to be replaced, while others will just need an exhaust pipe fixed. Once the extent of the mufflers damage is evaluated, our team will make a suggestion on what your next steps should be. Finally, we’ll complete the muffler repair or replacement as soon as possible and get you back on the road in no time. Whether your muffler needs repair or replacement due to damage, or you’d like to upgrade your car's exhaust system, our team of auto repair professionals has experience with aftermarket muffler parts. For some, aftermarket muffler parts can modify how your car sounds or how the exhaust looks for a more desirable and high end looking car. For others, aftermarket muffler parts can be a great alternative to repairing your vehicle’s muffler if you don’t have access to factory fitted exhaust parts down the line. Not ready to schedule a muffler repair or replacement, but have a question? Fill out our brief car diagnostic report and get your muffler repair questions answered by our East Lansing muffler repair experts at H&H Mobil.